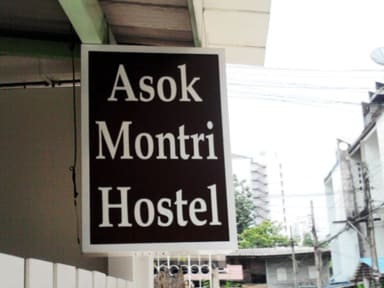 A brand new hostel in Sukhumvit, Bangkok. We’re a cozy and clean place to rest your head. The location is one of the best in Bangkok as it is only a walking distance to convenience stores, supermarket, major shopping centres, business centres, eastern bus terminal and others transportation system. We’re affordable for travelers traveling on tight budgets. Only 40 minutes from Airport by Airport Rail link & Skytrain, 1 minute walk from BTS sky train (Asok Station), 2 minutes walk from MRT metro (Sukhumvit station). 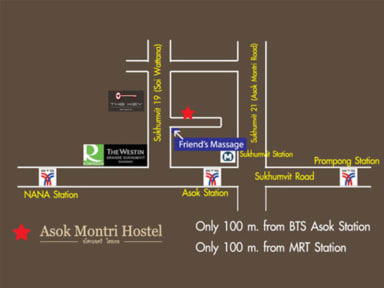 Truly, the best location for rest in downtown Bangkok!! -Free light breakfast at 9am. -Total payment of stay(deduct deposit) is required upon arrival.We accept cash payment only. -We have 4 floors with no elevator. All private rooms are on 2nd floor and 4th floor, dorm rooms are on 3rd and 4th floor. It's very nice hostel . I've stayed there few times when I went to Bangkok. Clean, perfect location, and friendly. They also do an excellent job on laundry service. Perfect location and very comfy beds! Clean and comfortable hostel- both dorms are private rooms are nice. Staff are lovely and has big kitchen area. Great location next to Terminal 21 and trains. Not a good hostel to meet people- seemed to be mostly older people staying there for business trips or people that didn't speak English. Convenient location right behind Terminal 21 mall and ASOK BTS line! Breakfast is simple bread and jam plus coffee/tea/ovaltine. We arrived late at 11Pm and the owner was nice enough to accommodate us. They were also very helpful with directions. The bed was quite soft but the aircon wasn't functioning fully. Nice street food around the area and massage places. Very friendly staff, speaking well english. Compared to other hostels very clean and tidy, location in quiet side street. Will stay there again and can recommend the place. Just used this place as a base and ended up staying in a friends apartment instead. The hostel is nice to sleep and that’s it. No atmosphere for backpackers. If you like some peace and quiet and no one else around this is perfect. Beds are comfortable and clean. Security is good with key card access everywhere. It served its purpose but nothing special. I have stayed at cheap places and still had nicer facilities. The gate is locked at night so that is nice. The staff is nice. The bed was average but comfy enough to sleep in. The private single room my friend had looked like a closet, only space for his bed. My shared private room was minimally bigger than his. Theres no mirrors in the rooms. The bathrooms are awful. Good location. I travel a lot and this is probably the worst place I've been to. Thankfully only had to stay for one night.